Sean Connery’s James Bond is Christopher Bates’ style icon and it definitely shows in the designer’s menswear collection. 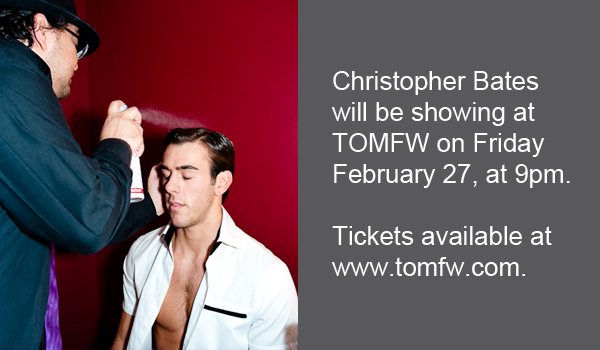 The former model turned fashion designer is now in his seventh year of business and will be showing at TOMFW, Toronto Men’s Fashion Week on Friday February 27th. When he is not designing, the former Vancouver boy enjoys travel, cooking and playing competitive soccer. In the final week leading up to TOMFW Christopher made time to take part in the following #stmINTERVIEWED Q&A which includes pictures of some of his favourite runway looks, behind the scenes happenings and even a shot of Christopher himself from his modelling days. Read on to learn more about his design inspiration, why he now runs his production out of Italy and the most valuable piece of advice he ever received as a designer. STM – What inspired you to enter the world of fashion and how did you find this particular niche to be your market? 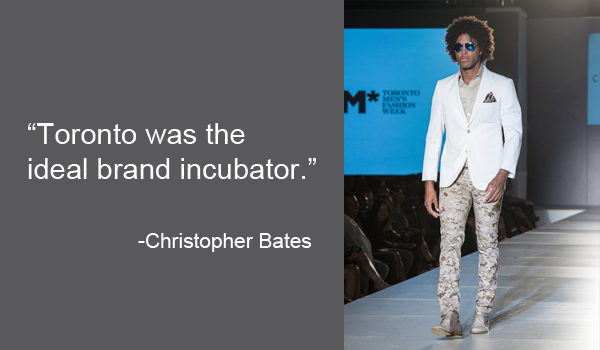 Christopher – I was passionate about fashion from a very young age. I always felt that cool clothes improved my mood. I’ve always had lots of ideas for clothes and had a sketchbook full of designs by the time I was 13. Still, growing up in Vancouver, I didn’t think of fashion as an industry in which to pursue a career. It wasn’t until I did a couple trips to Europe in my late teens and early 20’s that I became really inspired and realized there were people out there who would appreciate my ideas. When I was 26 I decided to become a designer. I sold my apartment, moved to Milan and studied fashion design at Istituto Marangoni. During the program my instructors encouraged me to focus on menswear. I agreed and it has become my niche. STM – Tell me about the man you design for. Who is he? Christopher – Career-oriented professional, style-savvy, confident, appreciates tasteful design and quality. STM – Fashion is a highly competitive game. Aside from quality what are things you try to offer to stay relevant? 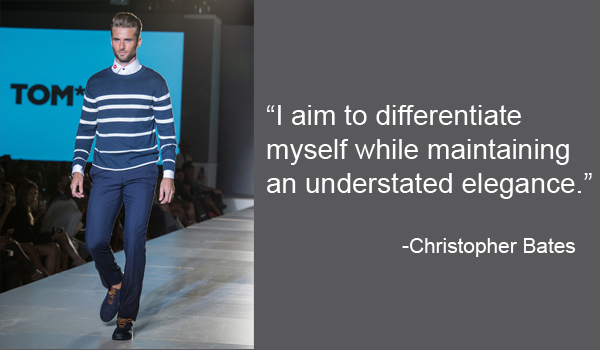 Christopher – My approach centres on details. I take classic menswear pieces and contemporize them through tasteful, clever, and stylish details. Combined with a tasteful colour-palette, unique luxury fabrics and a modern silhouette, I aim to differentiate myself while maintaining an understated elegance. STM – Did your experiences as a model influence or help you understand the fashion industry from a different perspective? What was something you learned as a model? 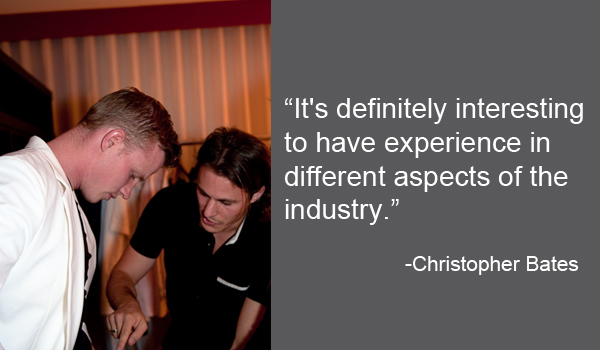 Christopher – It’s definitely interesting to have experience in different aspects of the industry. I think the experience helps me deal with models better as a designer. I’m able to communicate, relate and motivate them to do their best work. STM – While originally from Canada, you recently moved to design and produce the Christopher Bates Collection out of Italy. What were some of the deciding factors to move the business there and what are some of the biggest differences between running a fashion company in Italy vs. Canada? 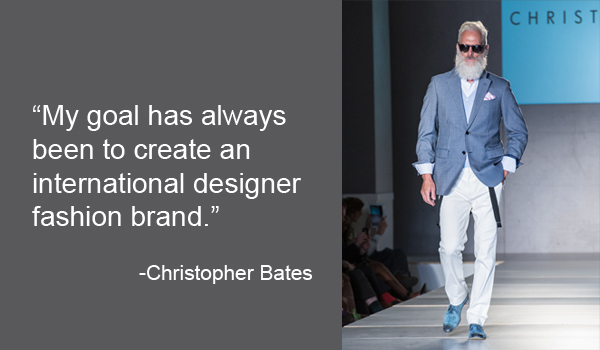 Christopher – My goal has always been to create an international designer fashion brand. Toronto was the ideal brand incubator. From there I was able to grow the brand to a respectable position in Canada while developing contacts and resources abroad. Most of my best contacts are in Italy. Further; part of my strategy is to produce everything in Italy as they truly have the best materials and craftsmanship, which are critical to the designer brand I am developing. I also hired a Sales Director who is Italian in June of 2014 so I’m working closely with him to expand our distribution internationally. For sales and marketing Milan is also an ideal base. It’s the fashion capital of the world in my opinion. I’m still running my business in Canada as well, but Milan has become my headquarters. Being based here is completely different in every aspect. Obviously there is a language barrier, as I don’t speak Italian. In general it’s a stimulating environment to be based. I’m totally inspired. Also, I’m meeting and working with people who are high-level industry veterans so I’m in good company. STM – Choose a picture (above) of one of your favourite past looks. Why did you choose this one? 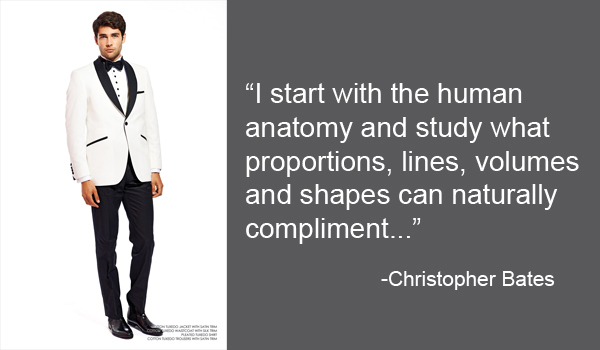 Christopher – This is a tuxedo from my Spring 2015 collection. It’s elegant, red-carpet ready and the proportions are exact. STM – For Fall/Winter 2015 I am told your collection titled Modular, was inspired by Leonardo da Vinci’s Vitruvian Man and its examination of geometry, mobility, proportion and architecture. What led you to this particular piece of artwork and what are some examples of how it influenced the collection? Christopher – These are recurring themes in my work. I start with the human anatomy and study what proportions, lines, volumes and shapes can naturally compliment and enhance the male form. Architecture inspires me to add strength to my designs. Mobility allows you to introduce details that offer form and function resulting in more interesting pieces that are also comfortable. The Vitruvian Man is Da Vinci’s ultimate expression of these fundamental principles so it’s a natural fit for my design methodology. Look for specific details such as anatomic seaming and paneling, bi-swing backs, strategic colour-blocking to add strength, and pieces that give the illusion of a slimmer and stronger form. STM – Which up and coming Canadian womenswear designer has your attention and why? Christopher – I would to like compliment my fellow Mercedes-Benz StartUp Program alumnae Malorie Urbanovitch. I like her style and she has good taste, which is actually quite rare. She has some beautiful knits in her Spring 2015 collection. STM – What was the most valuable piece of advice you were ever given as a designer? Who gave you this advice? Christopher – “Perfection is achieved, not when there is nothing more to add, but when there is nothing left to take away.” (Antonie de Saint-Exupery). My digital design instructor at Istituto Marangoni shared this with me and it has become part of my design ethos. 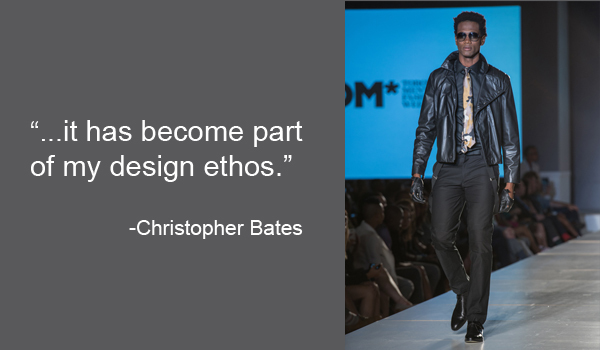 Make sure to follow @CBatesMenswear on twitter, instagram and facebook. For a list of stockists and to see current collections visit www.christopherbates.com. Illustration.Files: Christopher Bates F/W 2015 Sketch by Christopher Bates | Draw A Dot. Previous story Thom Browne Fashion Illustrations on Draw A Dot.